Bosch tankless water heaters have been designed using innovative technology to deliver in efficiency, quality, and energy conservation. With their kind of tankless water heaters, you can enjoy the endless hot water, an efficient energy saving of up to 50% of your utility bills and very extended warranties. There are three types of Bosch tankless water heaters, that includes, natural gas, propane gas, and electric tankless water heaters. Within this review article are three best Bosch tankless water heaters that go on to show how resourceful and convenient they are. 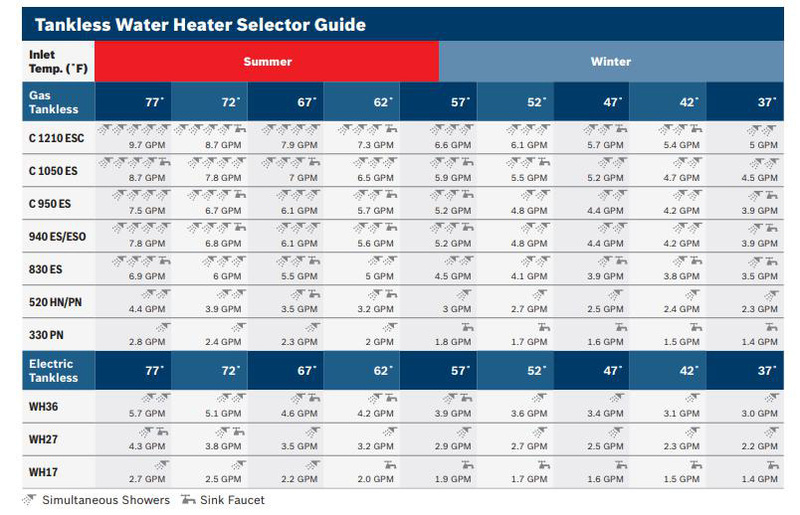 If you are looking to buy a qualitative and efficient tankless water heater, one of these three just might be the one for you. This is the highlight of this article, with three of the best Bosch tankless water heaters reviewed. The Bosch Greentherm C 1050 ES NG is by design smaller than other Bosch tankless water heaters in its class but still as effective. This makes it convenient for space as it maintains its high performance. Speaking of performance, the Bosch Greentherm C 1050 ES NG spots a maximum gas input of 199,000 BTUs and an energy efficiency factor of 95%. The best tankless water heater from a different manufacturer hits a maximum of 94% BTUs making this Bosch water heater one of a kind. It is also equipped with an automated and fully modulating bypass for unsurpassed DHW temperature stability. Still, on performance this Bosch tankless heater, the creators of the Bosch Greentherm C 1050 ES NG have incorporated in their design a water heater mobile app. This app is a convenient addition that allows for sizing and the downloading of technical documents. The C 1050 ES NG is equipped to comfortably supply up-to five fixtures on a warm day and three on a cold winter day, thus efficient for a sizable house. 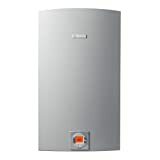 The Bosch 830 ES LP Therm tankless water heater is another efficiently designed tankless water heater with an energy efficiency factor, gas input and heat capacity that make it an Energy Star rated product. It spots an energy input that reaches a maximum of 175,000 BTUs which gives out a heat flow capacity of 8.3 GPM and an EF of 0.83. 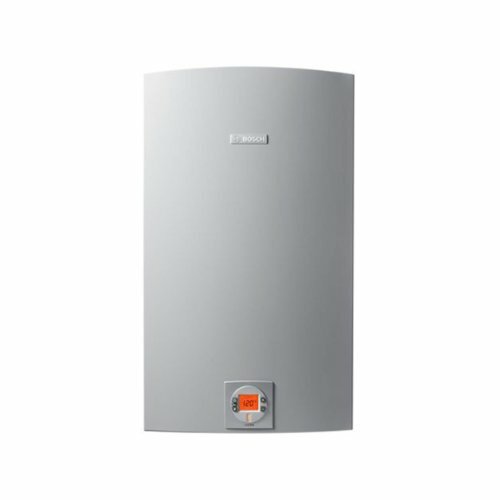 The Bosch 830 ES LP Therm, therefore, can comfortably supply a large home with hot water allowing 2-3 fixtures supply you with hot water simultaneously. It is also made to provide Intelligent Cascading of up to 24 units making it utile for large homes. This tankless water heater also features in-built freeze protection and a water filter that is externally accessible. 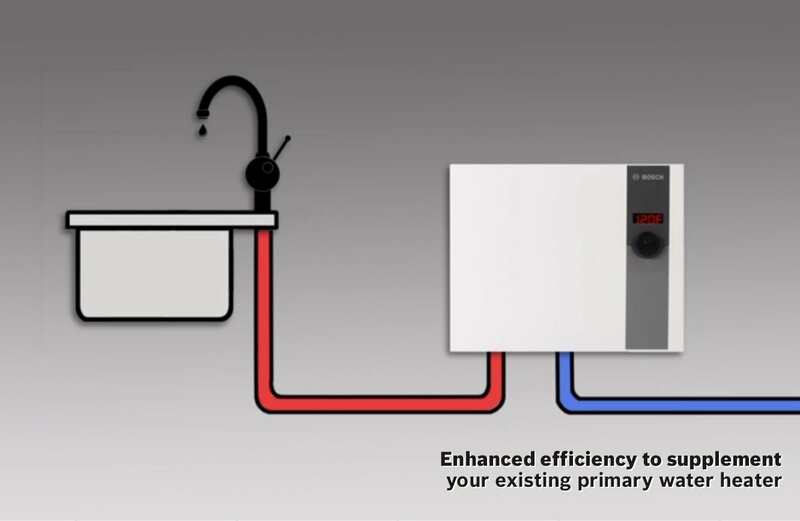 These specs make the Bosch 830 ES LP Therm tankless water heater suitable for assuring safer and a more expedient usage. 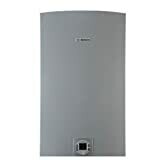 More on its convenient features include an electronic ignition system which despite it being a gas tankless water heater would need electricity to function. This kind of ignition system helps quicken the tankless heater’s activation. It also requires a 3″ -4″ diameter stainless steel vent pipe which enables a side wall or roof venting. 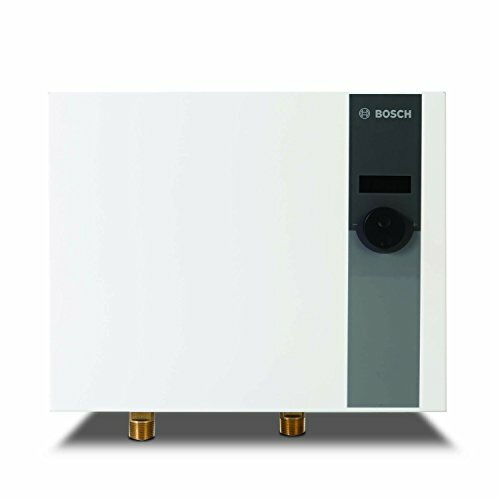 The BOSCH WH17 Tronic 6000 is among the most potent Bosch tankless water heaters. This model comes in a small compact design convenient to install and assured to perform. Its heat flow capacity and thermal efficiency make it legible to support a large home with multiple fixtures with hot water simultaneously, including homes in frigid environments, with a continuous and uninterrupted supply of hot water. Its small, lightweight and compact design make it convenient to install anywhere within your home, considering that it weighs 26.5lbs. The BOSCH WH17 Tronic 6000 also spots a thermal efficiency of 97% alongside a 0.6 GPM activation flow and a 95-131-degree Fahrenheit adjustable output water temperature. These are the figures behind its large home endless hot water support. It can simultaneously supply up to three faucets or showerheads regardless of the environmental temperature. 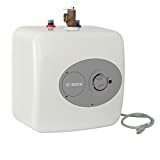 It also includes in its design a convenient modulating power which monitors the hot water demand and uses that to moderate the amount of power output. 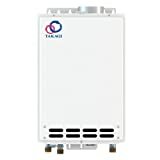 This helps to expediently reduce the event of temperature fluctuations and enhances the comfortable use of this tankless water heater. It also has an electronic flow sensor and scale prevention technology which work to enhance the BOSCH WH17 Tronic 6000 tankless heater’s performance and durability. 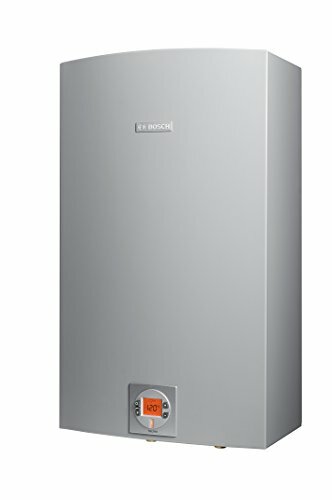 Speaking of sustainability, the BOSCH WH17 Tronic 6000 has been fitted with durable heat exchangers and a whole robust structure that the Bosch Group has it (the heat exchanger) at a limited warranty of 5 years and a 2-year warranty on the tankless water heater’s other components. This Bosch electric tankless water heater works with a voltage range of 208 to 240 from 17.25 kW of power and a 3/4″ MNPT connection. Its heat flow capacity ranges from 2.6 to 5.4 GPM which is ample for a whole house homes. Bosch is among the companies that provide the best tankless water heaters you can find on the market. However, their different models spot different designs that suit different kinds of users based on a number of factors. These factors include; the number of people the tankless heater aims to serve, your geographical locations, the size of your premises, the types of showers and tubs just to name a few major ones. 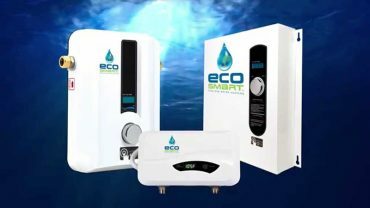 Conclusively, with the advancements in domestic water technology in the name of tankless water heaters, more and more people are making the change from water tanks to tankless water heating systems in their homes. Besides, who doesn’t want a modernized technology product that saves on energy, cost, space and works efficiently with convenient specs that add on its utility and safety? And with Bosch tankless water heaters all these utility and efficiency features are all accounted for plus more. Not to mention their durable designs and lengthy warranties to back them. With 125 years in the technology industry as a globally renowned provider of technologically products and services in areas of automotive, industrial technology, consumer goods, and building technology, the Bosch tankless water heaters are without a doubt the best equipped to keep your water running hot.